Even for personal injury lawyers who concentrate their practices exclusively on car accident claims; these claims can be confusing! A recent report commissioned by the Government of Ontario (The Marshall Report: Fair Benefits, Fairly Delivered) affirms this opinion. Car accident claims; specifically accident benefit claims along with the legislation surrounding those claims is overly complicated and needs to be simplified. 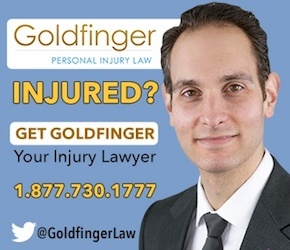 As an aside, if you would like to read about Goldfinger Injury Lawyers’s commentary on the Marshall Report, you can certainly do so here by reading our previous week’s installment of the Toronto Injury Lawyer Blog. Our law firm was commenting on the Marshall Report as early as April 12, 2017. It seems that major news outlets only caught on to this story around April 19, 2017; which is about a week after we wrote about the story. Lesson: For up to date personal injury news, information and commentary look no further than the Toronto Injury Lawyer Blog. Our comments on The Marshall Report are worth a read. We believe many industry outsiders are off base and out of touch with the reality of modern day car accident litigation in Ontario. And this is where we come in. To better help educate the Average Ontario Driver who is understandably flummoxed by how car accident cases work. If you have been hurt or injured in a car accident in Ontario, you have 2 claims! Not just one, but TWO! This may be your first time learning this! The first claim is an accident benefit claim. Accident benefits are referred to as “ABs” in the industry. Your own car insurance company is responsible for paying your accident benefits. This is the very nature of “no fault” insurance. Regardless of whose fault the car accident is, your OWN INSURER pays for accident benefits. If you didn’t have any form of car insurance, or you were a passenger, or you were a pedestrian, or cyclist, there are separate priority rules which we won’t get in to for the sake of this Toronto Injury Lawyer Blog entry. We are going to be dealing with the very basic example of your insured car, getting hit by another insured car. At its most basic form, your own car insurance company pays for these accident benefits. Accident benefits are NOT money for pain and suffering. Accident benefits are NOT money for your loss of competitive advantage in the workplace, housekeeping, home maintenance, or loss of guidance, care and companionship with a family member. Regardless of whose fault the car accident is, accident benefits will be paid! A driver can be 100% at fault, and still recover accident benefits! That’s it! That’s all that’s covered when it comes to accident benefits. The limits for these accident benefits are constantly changing. You can opt to purchase additional accident benefit coverage to increase those limits, but VERY FEW opt to do so. In addition, the government is constantly tinkering with these benefits at the behest of large insurers under the guise of keeping premiums down. The reality is that all this tinkering really does in decrease the operating costs of insurers so that they can maximize their profits. Hence, Ontario drivers are paying MORE, but getting LESS from their car insurance. Have your auto premiums gone down over the past year……Likely not, but the accident benefits available to you have DECREASED substantially. Part two of your car accident case is called the “tort claim“. This is the part of the case that people traditionally think about when they think of car accident litigation. This is the traditional suing part, where your lawyer sues the at fault driver. Pain and suffering is part of the tort claim. So is your loss of income, housekeeping claim, home maintenance claim, family law act claims, future care cost claim, along with ANY other loss which can be quantified and which is NOT covered by accident benefits. There is a $36,920 deductible for all car accident claims! That means that the first $36,920 of your tort claim vanishes. So, if a Judge awards you $40,000 at trial, after the $36,920 deductible is applied, you are left with only $3,080! If a Judge awards you $35,000; you get ZERO! This deducible is subject to inflation. It goes up year after year after year. In addition to the deductible, there is also a THRESHOLD for tort claims. This is a medico-legal test in order to recover compensation. A judge and jury need to deem that the Plaintiff’s injuries are a “serious and permanent impairment of an important bodily function”. If your injuries are NOT deemed to be BOTH SERIOUS AND PERMANENT, then you will NOT recover any compensation; regardless of faults. That means that even if a drunk driver hits your car and is totally at fault, if your injuries are NOT SERIOUS AND PERMANENT, then you recover ZERO!!! There is a cap for damages on pain and suffering in Canada. That cap today sits at around $365,000. Your damages for pain and suffering CANNOT exceed this cap unless the Supreme Court of Canada changes their minds and over rules a series of three cases which established this cap. In order to claim damages for lost wages or income loss, you need to have reported your taxes. No tax returns which show an income, then no income loss. Cash operators who don’t pay their taxes or report their earnings will lose out.